Asakusa Park was to Meiji Tokyo what Shibuya is today, a place for the middle and lower class masses to go and amuse themselves at low cost. Hanayashiki was the top crowd puller here. Opened as a flower park in 1853 by a gardener named Rokusaburo Morita, it soon began its amazing transformation into an amusement center with tea shops, entertainment and animal exhibits. Although the words hanayashiki and yuenchi nowadays make Japanese immediately think of amusement parks, they originally had quite different meanings. Hanayashiki referred to public flower gardens, while yuen was the Japanese translation for park. Asakusa’s Hanayashiki, generally seen as Japan’s very first amusement park, played an important role in altering these meanings. Hanayashiki’s metamorphosis started around 1872 with the installation of “exercise machines.” Around 1883, the first pavilions were opened. But it took a young lumber dealer by the name of Kinzo Yamamoto to make the transformation complete after he became manager of the park in the late 1880s. The area next to Hanayashiki followed its example. Japan’s first Ferris wheel was transferred to this location from a fair held in Ueno Park in 1907 and a large number of theaters for plays and movies were build. The combination of zoo and amusement park, first explored by Hanayashiki, became so popular that it can still be seen in Japan today. 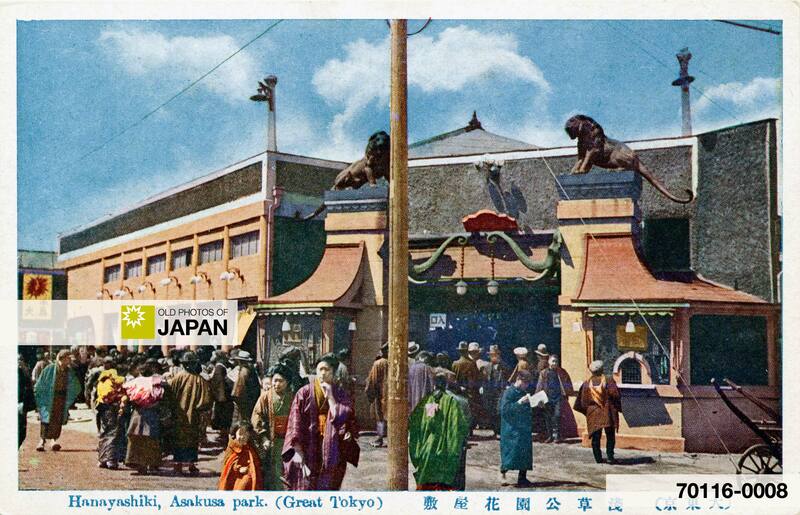 Until Tokyo Disneyland was opened in Chiba in 1983, animal exhibits were a mainstay of Japanese amusement parks. Many Japanese zoos still offer rides for children. When the Togo Company took over operations of the park in 1949, a host of new rides were introduced. In January 2004 Togo declared bankruptcy and sold Hanayashiki to Bandai, a Japanese toy company, which to this very day runs Hanayashiki as a popular amusement park. In a way, the park has mirrored Japan’s own remarkable transformation. It opened in the same year that Commodore Perry’s Black Ships arrived at Uraga Harbor and has been able to adjust itself to the times ever since. 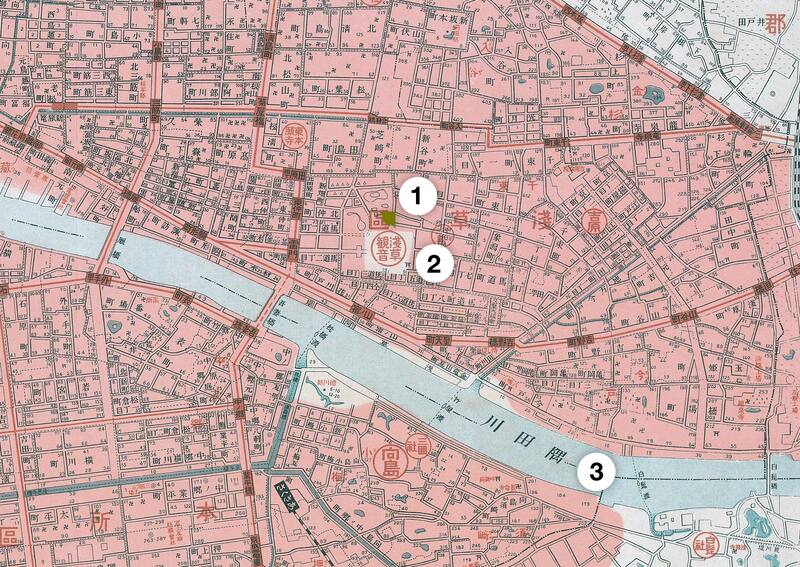 1879 (Meiji 12) and 1923 (Taisho 12) Map of Asakusa: 1. Hanayashiki; 2. Asakusa Temple; 3. Sumidagawa. The red color on the 1923 map shows the area where fires raged after the Great Kanto Earthquake. 1 National Diet Library, Asakusa Hanayashiki: Transformation from a Park to an Amusement Park. Retrieved on 2008-03-26. 2 岩崎徂堂 (Iwasaki, Sodou) (1903). 新事業発見法 (Shinjigyou Hakkenhou). 東京：大学館 (Tokyo: Daigakkukan), 103. 3 Asakusa Hanayashiki, Asakusa Hanayashiki. Retrieved on 2008-03-26. You can also licence this image online: 70116-0008 @ MeijiShowa.com. 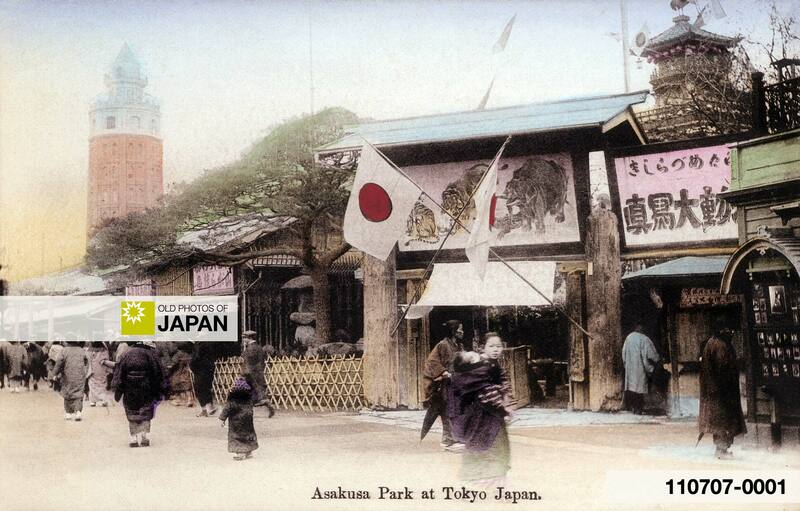 Wow, it is amazing to compare the landscapes of Japan from the past to the landscape of today. Obviously there’s so much more culture in the buildings of the past, than the industrial towers of today’s cities.